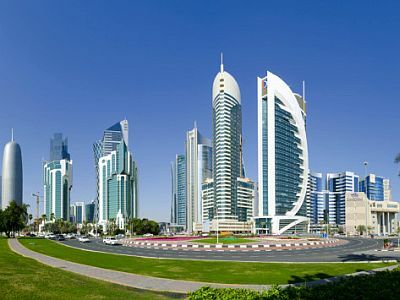 In Doha, the daily average temperature ranges from 18.5 degrees Celsius (65 °F) in January to 37 °C (99 °F) in July. Here are the average temperatures of Doha. The prevailing wind is moist and blows from the north-west, more frequently in the summer months. Another wind, hot and dry, can blow throughout the year, but preferably in spring; it blows from the south and it's able to raise the temperature to about 30 °C (86 °F) in winter and to about 40 °C (104 °F) and above from April to October, while drastically lowering relative humidity; it is also able to raise dust and sand storms. The scarce rainfall occurs during the winter months, and it amounts to less than 100 millimeters (4 inches) per year. Every now and then, some rains may occur also in spring, in March, April and even May, while in summer it never rains. The rains in Qatar occur in the form of brief but sometimes heavy showers, which can sometimes fill the wadis, the river beds which remain dry most of the year, and cause even flooding. Here is the average precipitation in the capital, Doha. In winter, from December to February, temperatures are mild and the sky is often clear, so it's a spring-like season. Lows are around 14/17 °C (57/63 °F) and highs around 22/25 °C (72/77 °F). However, there can be some cool and windy days, especially in January, with temperatures below 10 °C (50 °F) and night and around 15/16 °C (59/61 °F) at mid-day. Summer is very hot, with highs from June to August around 42/43 °C (108/109 °F) and lows around 30/32 °C (86/89 °F). There are torrid days (that is, very hot and dry), when the wind from the inland desert prevails, and the daytime temperatures rise above 40 °C (104 °F), and sometimes up to 45/47 °C (113/117 °F), while other periods are less hot but more humid, with highs around 37/38 °C (99/100 °F) and sweltering heat. Over the course of the summer months, the relative humidity gradually increases, so much so that the second part of the season, in August and September, is particularly stifling. The combination of moisture and temperature that is observed in summer in the countries of the Persian Gulf, is actually one of the worst in the world. The sun in Qatar shines all year round, sometimes however some cloud banks can move over the country, even in summer. The sea in Qatar is a bit cool from January to March, particularly in February, when it reaches the lowest temperature, about 20 °C (68 °F), while it's still quite warm in December, when it's about 24 °C (75 °F). In summer, the waters of the Persian Gulf become very warm, exceeding 30 °C (86 °F) from June to October. The best time to visit Qatar runs from mid-November to mid-March: it is the only time of the year which is not hot. In general, the weather is mild and sunny from December to February, warm but not too much in November and March. Some cloudy days are possible, sometimes with rain, especially from December to February. In winter: bring light clothes for the day, a sweater and a jacket for the evening and for cool days, a scarf for the wind. In summer: bring lightweight clothes, made of natural fabric (cotton or linen), a desert turban, a sweatshirt and a scarf for air conditioned places. It's better for women to avoid shorts and miniskirts outside of tourist resorts.